The Legend of Zelda Ocarina of Time is one of the coolest instruments I've seen and played. I actually thought it was just a toy that I was going to be reviewing. But as I continued researching it, I learned that people actually take lessons to learn how to play an Ocarina. My 11 year old son helped me test the Legend of Zelda Ocarina of Time. He's a huge Legends of Zelda fan, so was thrilled that I asked him to help me review it. 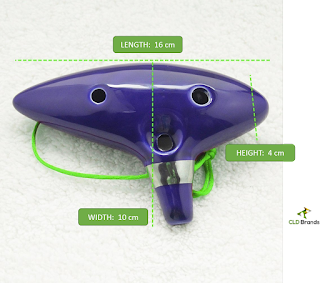 The Legend of Zelda Ocarina of Time instrument is made of high-quality, kiln-fired ceramic. It has 12 holes that allows you to play sounds ranging from A4-F6 including sharps and flats. My son and I have never played an instrument like this before. However, within minutes he was able to play notes. 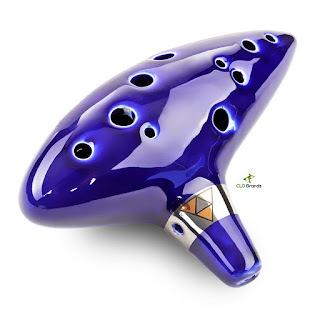 My only concern with the Legend of Zelda Ocarina of Time is that it is made of ceramic. Every time my son picks it up and holds it, the first thought that runs through my mind is, "Please don't drop it." I can just see it shattering on the floor and tears flooding his eyes. Other than that, I highly recommend it, especially if you have a Legend of Zelda fan in your house. Price is reasonable and seems to be discounted on Amazon, making it a great gift for kids. I was given the Legend of Zelda Ocarina of Time for free without compensation for my honest opinion.